Today, we publish the portrait of Andreas Martinsen, the famous hurdles runner from Aarhus, known for his Danish record on 110 meters, in the time 13’50’’ and on 60 meters hurdles in the time 7’69. Let us tell you more about this tall blond guy from Aarhus 1900, about his determination and hard work but also why we are working with him as an ambassador & Hero of our brand. Andreas has an impressive career as an international athlete and have managed to qualify and participate in many of the biggest competitions of the world. His passion? Hurdles, that he discovered at 11 and since then, never stopped. At 16, he starts competing for many Junior Championships, and managed to arrive on podium with the bronze Medal at the European Youth Olympic Festival. His great youth achievement carried on the same year, and brought a 4th place at the World Youth Championship. 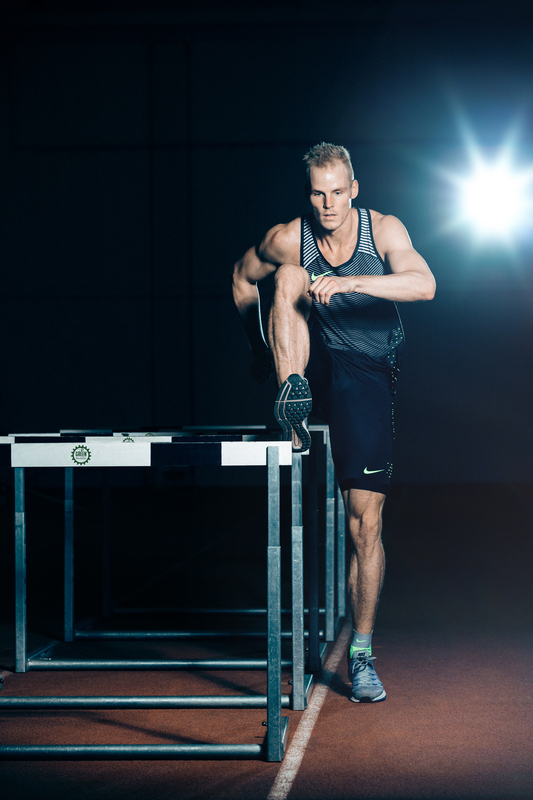 At 19, in his last Youth Championship, Andreas was successful in qualifying for a spot in the final by running his best race with a 13,49 chrono time at 110m hurdles. From 2011 to 2015, many injuries held Andreas back and it was hard to perform on the international stage. He failed to qualify to the London Olympic games because of a foot injury, but didn’t lose any motivation. Hard work in rehab sessions and loads training, and Andreas is ready for the next season who was supposed to get him back on track in the same physical shape as that of before the injury. 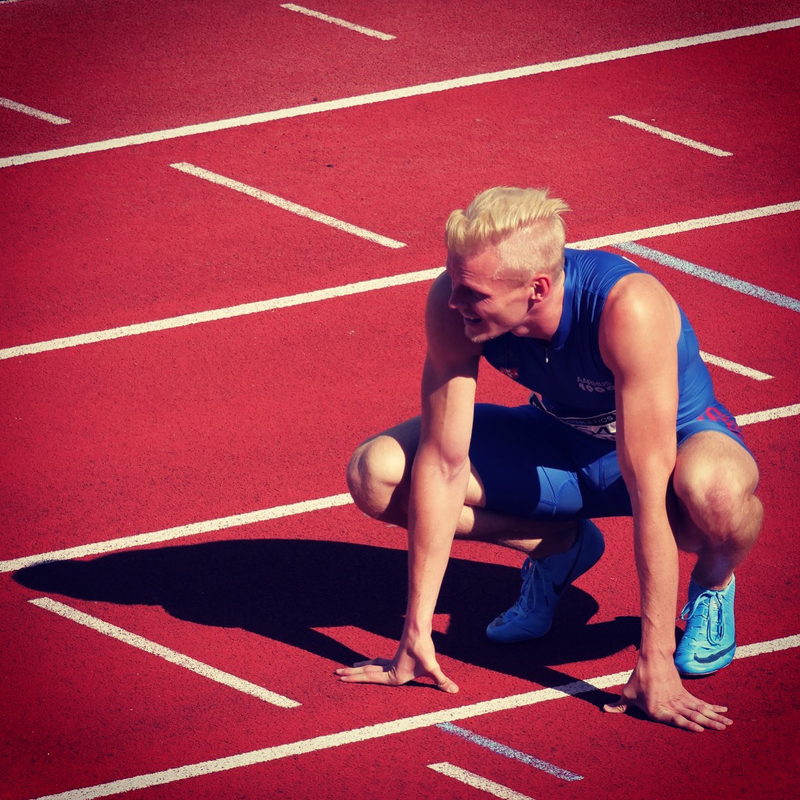 Now he is definitely back in the game, and in 2016, he is the only Danish flying to Portland to represent Denmark in the World Indoor Championship for hurdles sprint. Andreas stays in the lead until semi-finals and finishes 13th with 7,75 for 60 meters hurdles. Last year, in Belgrade again at the European Indoor Championship, he arrives 8th and in doing so establishes the national record of 7,69! When Andreas is not training, Andreas loves to travel around the globe. He calls the off-season “the best part of the season” because that is the moment he can relax and plan his trips. What he likes about travelling is discovering another culture and get intimate with local customs and ways of living. He feels like he is able absorb the energy from the different places he visits, and loves to try out new food. His last trips were in the Maldives, in Dubai and in Sri Lanka. Andreas is currently injured and is not participating for the rest of the season of 2018. Indeed, last year he was already injured at his left foot and has been recovering from this injury since July 2017. 10 months without competition made him unable to practice technique, which is very important for hurdles races. He decided to join the season anyway and it was going pretty well when at the turning point in the training, he injured himself again. We are at the end of the season, and intense recovery training is on the menu, for Andreas in order to return stronger than ever next year. His goal for the next season is to achieve full recovery and participate at the next European Indoor Championship in march 2019 in Glasgow. His ambitions is also to take a step ahead and qualify for the World Championship in October 2019 in Qatar. Last year, Andreas managed to run the 60m hurdles finals and has a burning ambition to run a final again with an even better result. Why is Green Machine and Andreas such a great mix? First off, Andreas has allergies that do not allow him to pick a random bar for his training. His allergy to milk is a big constraint for him as an athlete because of the presence of milk protein in many products that helps gain muscles. Optimal protein synthesis is important when you train as many hours as Andreas, and It is difficult to find protein bars that do not use dairy products. When you finally find some bars not using milk protein, they are made with soya or almond milk, and do not taste well or have a too dry or coarse texture. 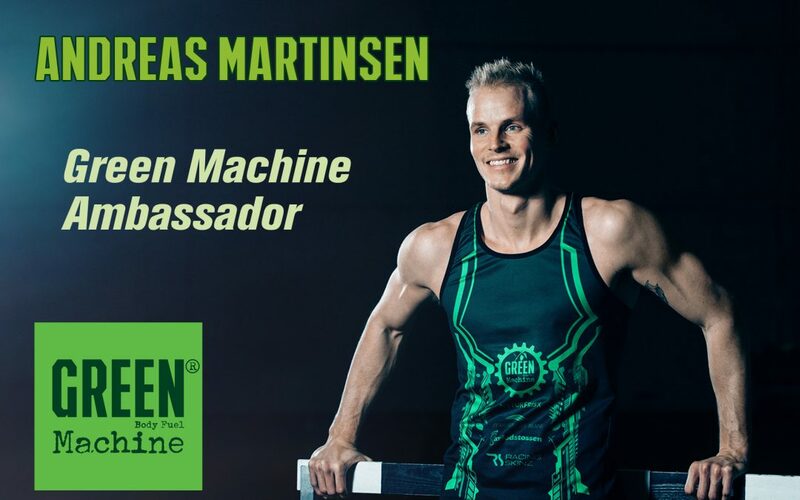 At Green Machine, we create vegan products without any dairy ingredients and with a focus on what is important for the athlete, like a wide energy profile, high protein content and wide amino profile, antioxidants and culture for the gut flora for aided protein synthesis. So, with Andreas’s specific needs and Green Machine’s special products, we saw the opportunity for a great relationship. His favorites among the Green Machine’s products are the bars, and the optimal fit for Andreas are the VegaMaxx and ReCharge. For him, they both have great flavors and they are perfectly adapted for his training, a little bonus for the VegaMaxx bar as Andreas says “It is easy to chew and digest, it is my favorite!!”. “I have always suffered from the skin condition Atopic Dermatitis and for my part I react heavily to lactose. This means I cannot use most of the normal protein supplements and a lot of sports nutrition. To a serious athlete like me this poses a huge problem, as I need to spend all my time on training and nutrition and I have no time to be in a down period, recovering from eczema or worse. For years, I have searched the market for good and serious products that I can use during training or races, for optimal recovery in between or directly after my training, which for my part has proven difficult to find. It was total coincidence that I acquainted myself with the Green Machine products. I was participating in 3 disciplines at the season finale and that particular day I had some issues with.Muscle cramps and the general wait between the 3 disciplines I was racing. My sports masseur Flemming Andry was present and he introduced me to Caspher, the founder of Green Machine. We talked a little and after a couple of minutes Caspher convinced me to try a couple of his bars which I did. My races in the season finale were won and I stayed in contact. It didn’t take long till both Caspher and I realized that we shared a common interest. I feel that I have come across a brand that takes their products to the next level and I am very happy to experience that I can use these products with the added benefits that they are organic, free of additives and with a focus on serious functional properties. Andreas isn’t a vegan but almost, he decided to stop meat for environmental reasons and could not be happier of this choice. He feels like his stomach is lighter and the digestion process is so much easier, he said. He really saw a transformation when he stopped, and feels that he performs better at his trainings too. For Andreas, it is important that a company helps designing a future regarding the environment by trying to minimize the impact it has on nature. At Green Machine, we are fully on pair with this and this is one of the many reasons why Andreas chose to become a Hero for Green Machine. The products are 100% organic and made in Denmark – this is a benefit for us as we have better control of the quality and it is environmentally responsible. We do not use any artificial sweeteners, preservatives or colorings. Running a responsible business and manufacturing only products of the highest quality is important and we prefer to work with partners who share the same vision about food and environment. We participate only in markets where our products make a difference and we strive to be visionary and best in the market. We love and admire people like Andreas who’s self-determination, motivation and execution is an inspiration to all. Andreas’s view of the competition is that winning is the only goal, his own personal motivation is to make it to the top without second guessing himself. As an athlete competing for a World Championship, you need to know what others are doing to perform better, and you need to do more than them, to push it harder, he said. Andreas is a champion and he knows what needs to be done to come back and stay on top. We are entirely behind him for the next competition and know he will surpass himself.